Some of us have a bad habit of throwing away product manuals without reading its instructions. But if you’re one of those people who still value the purpose of a manual, then you’ve probably read its content and realized how much easier things would be if we just learned to follow what’s written on paper. You may also see creative email signature examples. It’s amazing how technical writers can easily transform a complex idea into something simple and understandable. Though there are times when we may have taken their efforts for granted, during our most desperate moments, the works of a technical writer are a definite lifesaver. However, being a technical writer isn’t as easy as it seems. Not many people seem to recognize the role you play as a professional, making it difficult to find work in a competitive market. So in this article, we discuss how you can pursue a career in technical writing as well as the purpose of email signatures in a technology-based profession. Technical writers are also known as technical communicators. They are responsible for preparing instruction manuals, journal articles, FAQ pages, how-to guides, and other similar documents that are used to communicate technical information in such a way that a target audience could grasp. Technical writers are also responsible for developing, gathering, and disseminating complex information through a specific communication channel. 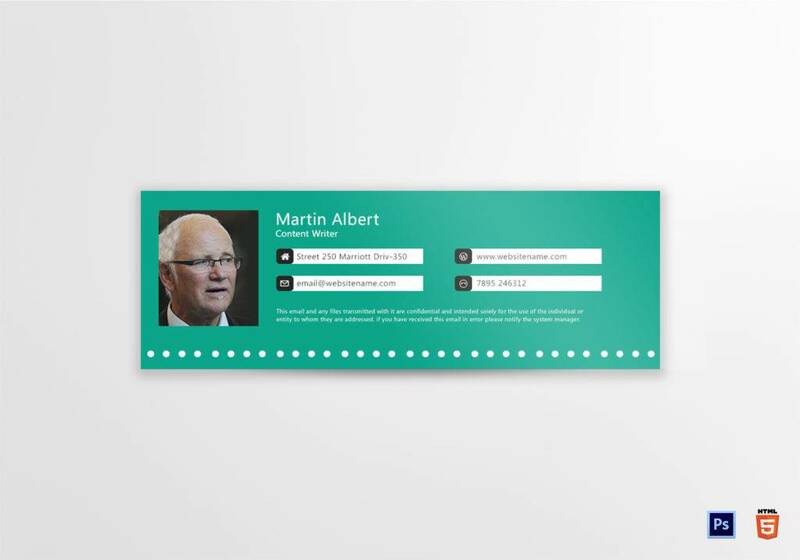 You may also check out here printable corporate email signature designs & examples. Technical writers can also play a key role in different industries. Some are even hired to help write grant proposals for research scientists and institutions. Though it’s common for a technical writer to be a college-degree holder, anyone with the experience in a technical subject, such as computer science, web design, or engineering, can pursue a career in technical writing. This, along with a few other skills, will help you perform your assigned tasks effectively. You may also see software developer email signature examples. Unlike content writers, technical writers are required to explain complex ideas in a simplified manner. They often work with computer hardware engineers, scientists, support specialists, software developers, and IT analysts to manage the flow of information involved in a project’s development and testing. These concepts can be pretty complicated for an average person to understand, which is why the right choice of words can be crucial for technical writers. You may also check out here sales manager email signature examples. Keep in mind that it won’t be easy at first. Complicated systems are hard to learn, especially when they go beyond the surface. But this doesn’t make it impossible, as technologies may be learned with enough motivation. As mentioned before, the primary objective of a technical writer is to disambiguate a concept for the sake of its end users. Trying to explain something complicated in an easy-to-understand way can be quite challenging. This requires you to understand the concept thoroughly in order to convey it properly to audiences. You may also see college email signature examples. If anything, you need to keep your compositions as brief and concise as possible. Avoid passive sentences and long constructions, as this would only confuse readers. Make sure to define acronyms, and never assume what your users do and do not know. Sometimes, it’s difficult to convey a thought with words alone. This is why experts suggest showing your ideas in a graphical form. Almost everyone can understand concepts a million times better through visual interpretation. Some technical writers even use diagrams to indicate each step in the instruction manual. A few illustrations might also come in handy, especially when you have to be specific with your guidelines. You may also see business email signature examples. Anyone working in the field of Information Technology knows just how important it is to be patient. When it comes to problem solving and troubleshooting, you’re bound to face a few hurdles that may consume most of your time and energy. Patience and persistence come hand in hand for every technical writer. Control the urge to scream and slam your fist into the keyboard by taking a few breaks in between problems to ease your mind. You’d be surprised by how these qualities could make a seemingly impossible job easier. You may also see professional email signature examples. As a writer, you might not be as tech-savvy and computer literate as the rest of the members on your team, so you might feel a bit embarrassed to ask “dumb technical questions” that your colleagues are completely familiarly with. But then again, this is your job. For you to understand how something works and why, you need to do your own homework. This requires you to go after certain individuals to extract information. The information gathered from these interviews and Q&A sessions will help you fully understand how the system functions for a clear and precise delivery. You may also see training email signature designs. There are many reasons why people include email signatures at the bottom of their messages. If you think about it, closing your email with a proper signature can make a huge difference in the way people perceive you as a professional. And as a technical writer, you don’t always get to meet your recipients face-to-face. Emphasizing your identity and job role will certainly give recipients something to recognize you for. You may also see human resource email signature designs. In a competitive industry, standing out is of utmost importance. You need to set yourself apart from other professionals in the field to help raise recognition among clients and employers. Although you can’t solely rely on an email signature to make yourself known, it’s still an accessory that can be used to highlight your expertise. Some people even link their social networking pages, company websites, or online portfolio to the email signature for prospects to refer to. This is a great way to exhibit your capabilities like anyone with an ordinary resume would. Think of it as a business card. 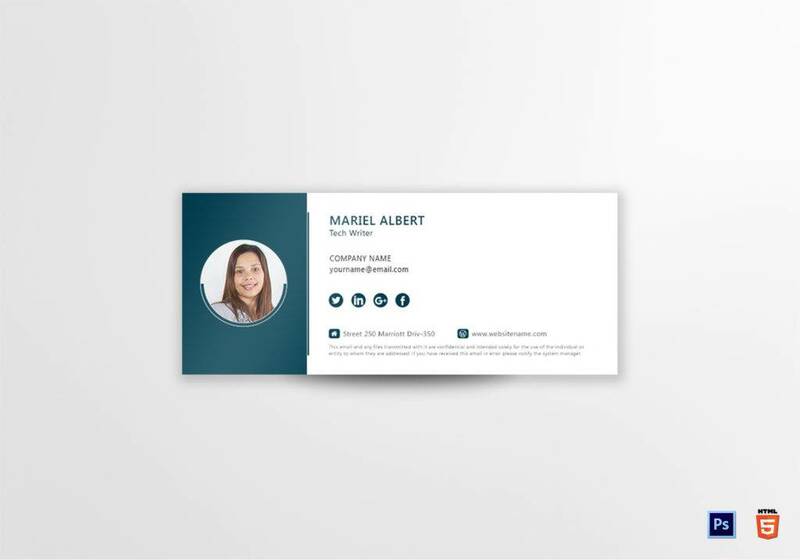 People use business cards to introduce themselves to potential investors, clients, and associates. Similarly, an email signature carries an individual’s personal information and job position as well. This will help establish your name as a working professional in the industry. It shows that you’re serious about what you do, and that you’re ready to cater to one’s needs whenever and wherever. The contact details listed on the signature would also make it easier for prospects to reach you if they ever find themselves in need of your services. The thing about an email signature is that nobody’s forcing you to look at it, but you end up doing so out of curiosity. This makes it a good form of “subtle” marketing where promotional efforts aren’t done directly. An email signature design can contain various elements that support your brand, such as brand colors, a logo design, and your company name. People who work as freelancers even create their brand identity for prospects to acknowledge. If you hope to pursue a career as a technical writer in the industry, make sure to create an attention-grabbing email signature with the help of these designs and examples. A good email signature is sure to pique the curiosity of recipients, prompting them to stay in touch with you via email and other communication platforms. You may also see tech startup email signature designs.